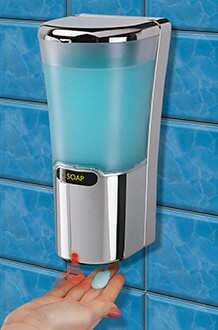 The new TOUCHLESS(TM) 'HANDS-FREE' DISPENSER with infrared sensor technology provides "touch free" activation. Perfect for bathrooms and kitchens in Homes, Offices, Factories, Schools, Hospitals, Seniors Homes, Restaurants. Simple push-button adjustment of dispensed amount. Hands-free operation is convenient and minimizes risk of germs. Long Battery Life. Four AA Batteries (not included) deliver up to 10,000 cycles. 90 day warranty.